What’s Your Share of Your State’s Debt? The following chart appeared in a Bloomberg article several weeks ago comparing the size of all-but-completely-bankrupt U.S. territory Puerto Rico with the 50 states. You might want to click on the image to see a larger one to see how your state ranks. Puerto Rico’s debt per capita of $15,637 is more than 10 times higher than the average debt per capita of the 50 states, according to Moody’s. The rating company does not include city, county, or agency debt in the calculations for U.S. states unless the state guarantees the debt. 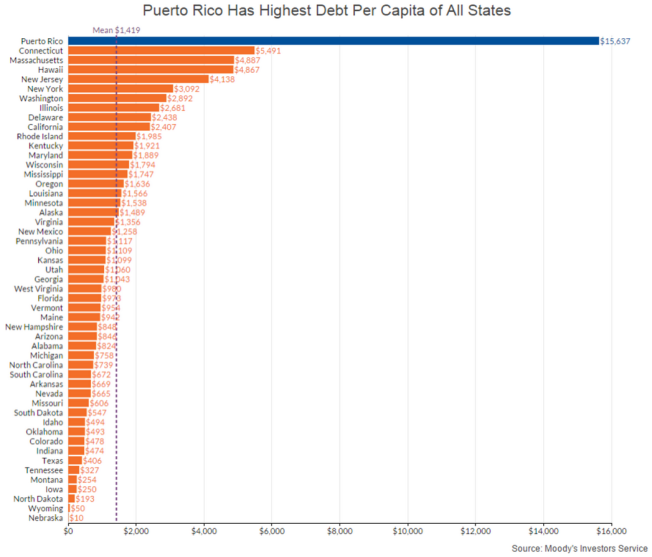 That differs from the totals for Puerto Rican debt, which include all the island’s debt except that of Prepa, the island’s public electric utility. The state with the worst debt-per-capita figure is Connecticut, where the debt burden is a little under a third that of Puerto Rico. But that’s not the state that’s the worst off because of its debt – we’ll have more on that dubious honor later this week! Where Do the U.S. Government’s Bureaucrats Work? 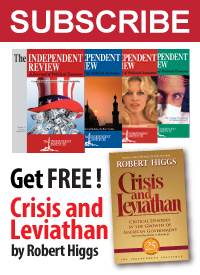 By linking to Amazon.com from this page, Independent Institute earns referral fees of 4% to 15% from whatever you buy. Bookmark the above link and you can support the Institute when you do your normal shopping! By William J. Watkins Jr.